- The god weapons obtained through a conversion step II is a system that can upgrade to a more powerful weapon. Strengthening exchange located in the Great White spirit can be strengthened from the Marco dalko NPC. ① Click the enhanced exchange dalko npc Marco is located in the Great White Horn, click 'New Strength "in the active menu. 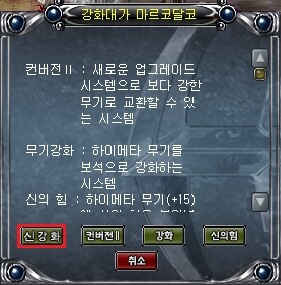 ② proceed to the place of God after the reinforcement strengthen and enhance the item in a window that is activated by clicking on the menu item ingredients. 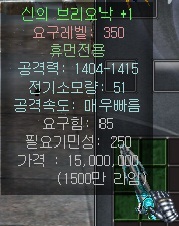 ③ proceed with the enhanced divine weapon to success when it is +1, the damage increases. * If the item to the item to be updated sinseok shining future is now impossible to acquire the item.